The Paleoclimate Modelling Intercomparison Project (PMIP) has been set up to provide a mechanism for coordinating paleoclimate modelling and model evaluation activities, to understand the mechanisms of climate change and the role of climate feedbacks in these changes. PMIP is now in its fourth phase: PMIP4. Five PMIP4 experiments have been proposed within the framework of the CMIP6 exercise. Other periods and sensitivity experiments are also planned to assess climate sensitivity, changes in hydrology, long-term trends and interannual to millennium variability. This special issue is devoted to the description of the design of the PMIP4 experiments, of data syntheses to which model results can be compared, and to papers analysing single or multi-model results from PMIP4 and CMIP6 experiments. Papers can either be submitted to GMD (model and simulation descriptions, data syntheses in support of the experimental design or of model-data comparisons) or CP (in-depth analyses, multi-model analyses, model-data comparisons). Here, as part of the PAGES-PMIP working group on Quaternary Interglacials, we propose a protocol to perform transient simulations of the penultimate deglaciation under the auspices of PMIP4. This design includes time-varying changes in orbital forcing, greenhouse gas concentrations, continental ice-sheets as well as freshwater input from the disintegration of continental ice-sheets. This experiment is designed for AOGCMs to assess the coupled response of the climate system to all forcings. The Deep-Time Model Intercomparison Project (DeepMIP) is a model-data intercomparison of the early Eocene (around 55 million years ago), the last time that Earth's atmospheric CO2 concentrations exceeded 1000 ppm. Previously, we outlined the experimental design for climate model simulations. Here, we outline the methods used for compilation and analysis of climate proxy data. The resulting climate “atlas” will be provide insights into the mechanisms that control past warm climate states. One of the consequences of the changes in the shape of Earth's orbit over time (in addition to pacing glacial/interglacial variations) is changes in the length of months or seasons. The well-known “paleo calendar effect” that results can produce patterns in comparisons of present-day and paleo climate-model simulations that could be mistaken for real climate changes. We illustrate the source of those patterns and describe an approach and set of programs for routinely adjusting for the effect. The behaviour of dust in terms of climate can be investigated using past climate. The Last Glacial Maximum (LGM; 21000 years before present) is known to be dustier. We investigated the impact of plausible dust distribution on the climate of the LGM using an Earth system model and found that the higher dust load results in less cooling over the polar regions. The main finding is that radiative perturbation by the high dust loading does not necessarily cool the surface surrounding Antarctica. 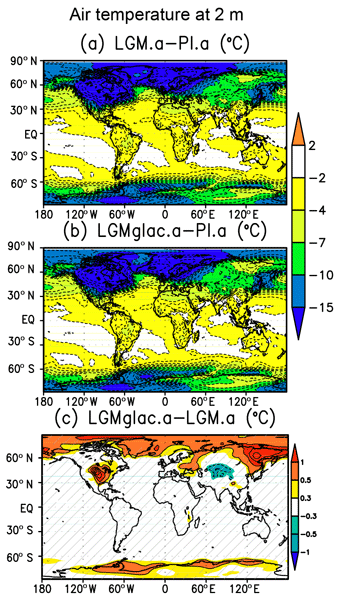 The Last Glacial Maximum (LGM, 21000 years ago) is an interval when global ice volume was at a maximum, eustatic sea level close to a minimum, greenhouse gas concentrations were lower, atmospheric aerosol loadings were higher than today, and vegetation and land-surface characteristics were different from today. This paper describes the implementation of the LGM numerical experiment for the PMIP4-CMIP6 modelling intercomparison projects and the associated sensitivity experiments. Climate model simulations covering the last millennium provide context for the evolution of the modern climate and for the expected changes during the coming centuries. They can help identify plausible mechanisms underlying palaeoclimatic reconstructions. Here, we describe the forcing boundary conditions and the experimental protocol for simulations covering the pre-industrial millennium. We describe the PMIP4 past1000 simulations as contributions to CMIP6 and additional sensitivity experiments. The PMIP4 and CMIP6 mid-Holocene and Last Interglacial simulations provide an opportunity to examine the impact of two different changes in insolation forcing on climate at times when other forcings were relatively similar to present. This will allow exploration of the role of feedbacks relevant to future projections. Evaluating these simulations using paleoenvironmental data will provide direct out-of-sample tests of the reliability of state-of-the-art models to simulate climate changes. In this paper we describe the experimental design for a set of simulations which will be carried out by a range of climate models, all investigating the climate of the Eocene, about 50 million years ago. The intercomparison of model results is called 'DeepMIP', and we anticipate that we will contribute to the next IPCC report through an analysis of these simulations and the geological data to which we will compare them. This manuscript presents the experiment design for the PMIP4 Last Deglaciation Core experiment: a transient simulation of the last deglaciation, 21–9 ka. Specified model boundary conditions include time-varying orbital parameters, greenhouse gases, ice sheets, ice meltwater fluxes and other geographical changes (provided for 26–0 ka). The context of the experiment and the choices for the boundary conditions are explained, along with the future direction of the working group. The Paleoclimate Modelling Intercomparison Project (PMIP) takes advantage of the existence of past climate states radically different from the recent past to test climate models used for climate projections and to better understand these climates. This paper describes the PMIP contribution to CMIP6 (Coupled Model Intercomparison Project, 6th phase) and possible analyses based on PMIP results, as well as on other CMIP6 projects. Our paper presents the experimental design for the second phase of the Pliocene Model Intercomparison Project (PlioMIP). We outline the way in which climate models should be set up in order to study the Pliocene – a period of global warmth in Earth's history which is relevant for our understanding of future climate change. By conducting a model intercomparison we hope to understand the uncertainty associated with model predictions of a warmer climate.